Taumatawhakatangihangakoauauotamateaturipukakapikimaungahoronukupokaiwhenuakitanatahu is the Maori name for a hill, 305 m high, in New Zealand.The name on the sign that marks this hill, which translates roughly as - The summit where Tamatea, the man with the big knees, the climber of mountains, the land-swallower who traveled about, played his nose flute to his loved one. 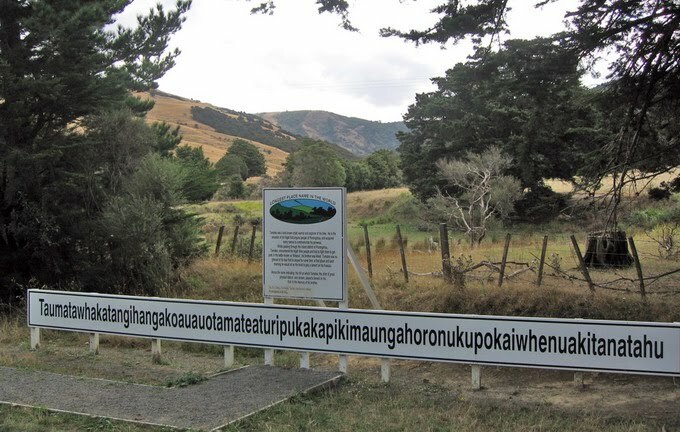 At 85 letters, it is one of the longest place names in the world and one of the longest words used in English. There are other places which compete for the longest name, a village in Wales boasts a village called Llanfairpwllgwyngyllgogerychwyrndrobwllllantysiliogogogoch (58 letters), which in English means "Saint Mary's Church in the hollow of white hazel near a rapid whirlpool and the Church of Saint Tysilio near the red cave." The locals call it Llanfairpwll (pronounced thlan vire puth). Recently Bangkok is claiming that it has the longest name, Krungthepmahanakornamornratanakosinmahintarayutthayamahadilokphopnopparatrajathaniburiromudomrajaniwesmahasatharnamornphimarnavatarnsathitsakkattiyavisanukamprasit (163 letter), this claim is not yet officially recognized, who knows we might see this toppling the record for the longest name in the future but till then the city in New Zealand claims the top spot.